As students mature, their reading material will present more challenging content, and may include strong language and more mature themes. We have placed footnotes linked in red beside those books that most parents will consider an issue. However, we cannot anticipate which content might be an issue for every family. We encourage parents to pre-screen material to determine its appropriateness for their child and family. 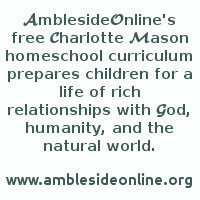 Note: Our booklists are incomplete without a thorough understanding of Charlotte Mason's ideas and methods. Please take time to familiarize yourself with her philosophy by reading her books. Additionally, our FAQ provides basic instructions and information about the AO curriculum, and answers all the questions that people routinely ask: AO's history scope and sequence, how to schedule your school days, how to do narration, and more. This is a collection of some of the best resources for this time period. Even Advisory members aren't able to cover all of these with every single one of their own students and have to be selective. Feel free to pick and choose from among these suggestions. The best choice may just be the book you already own, and the one from which your student can narrate. Read Wendi's informal chat about why these books were chosen and which ones are indispensable. (If this looks overwhelming for your student, you might consider plan B - a lightened load for year 7. See it here. Purchase a good English handbook. An Advisory favorite is The Little, Brown Handbook ($). Some may find Writer's Inc. more user friendly ($). Charlotte Mason had her students do house or garden work, make Christmas presents, other crafts, sew, cook, learn first aid . . . The Life and Death of Cormac the Skald β anonymous Icelandic epic. 16. The Birth of Britain is Volume 1 of Winston Churchill's 4 volume set, "A History of the English Speaking Peoples." The next three volumes will be used in Years 8, 9 and 10. Don't get the one edited by Henry Steele Commager, as it's abridged. For planning purposes, there is a Table of Contents with dates for all 4 volumes of A History of the English Speaking Peoples, and a schedule to break down the week's chapter into 4 short daily readings. Mapwork for Roman Britain and Ireland. Northern Gaul outline maps also available. For those who would like a way to find modern town names. An overall quiz on Medieval locations. Europe as it was in the timeframe covered in Year 7 studies. The most straightforward outline maps of modern world. Some easy-to-read maps of Europe in the Year 7 timeframe. Blank outline map of Late Medieval Europe. 42. Ourselves: approximately 22 pages per term. This book will continue through all the remaining years of HEO curriculum. This is the 4th volume of Mason's 6 Volume Series. This year: pages 1-65 of Book 1. 46. Charlotte Mason had students at this level read the daily news and keep a calendar of events. We suggest students choose the most important 2 or 3 stories of the week and re-write them in their own words as a chronicle of the year, making the heading of each page something like "This Week in History, September 1st, 2003." Parents: pre-read and filter current events materials (on the web, or in print) as necessary, due to the potential for coverage and topics of an explicit nature, even from conservative sources. We've listed some possible options here. 48. Beowulf: AO recommends the edition of Seamus Heaney's translation with graphics that illuminate the setting and objects mentioned in the text. The page numbers in the 36-week schedule are from this book. ($); there's a cheaper edition of Seamus Heaney without illustrations. ($) Another favorite: an updated verse translation by Frederick Rebsamen ($ (K)); the version by Burton Raffel is also very accessible ($ K), or use this free-verse version. Another option: Online Translation by Francis B. Gummere. Most versions have 43 parts; that also appears in the 36-week schedule. 60. The Oxford Book of English Verse, 1919, edited by Arthur Quiller-Couch, is a poetry anthology Charlotte Mason used; it's very good, and it's online in a searchable format. (Poems 1-24, 29, 31-33) The same text, but with a different title, is also at Project Gutenberg β The best way to tackle these is to have your student rewrite them in their own words. There are some tips for reading Middle English here. As a parent resource, this site offers modern translations of the assigned poems. Click the first line, then click the word "translation" at the top. AO offers some rough and general modern translations here, but be aware that allowing your child to use paraphrases as a crutch will not help them acclimate to Middle English. Check online sites such as Librivox for free audio readings of poems. 68. Grammar: In terms of difficulty (easiest to most challenging), Easy Grammar Plus is probably the easiest, followed by Jensen's, and then Our Mother Tongue. 80. First Studies of Plant Life: this book will be continued next year. Planting, growing and observing germinating seeds and plants is necessary to benefit from this book. Also online at Google Books. 84. Signs and Seasons - read Prologue-Chapter 2 this year, including note on how to use properly. The book is cheaper from CBD. Field work is an integral part of this book. Field activities are included in the back of the book, so the field guide is not necessary. ** When The King Enjoys His Own Again; Farewell to Lochaber; Battle of Otterburn, or any other tunes of your choice from this website. Again, work on each song about 4 weeks, reviewing as desired. The idea is to enjoy them, not turn them into drudgery. 96. Charlotte Mason's students were learning three languages at this level. A good English/foreign language dictionary is also recommended.